Once again, Mature strikes back in KOFXIII and has far more tools than she did in the prequel of this game. Mature is an amazing rush down character with very good attack options and a rather lengthy special move set. The player can utilize Mature for any team position and she be played under many conditions as well, because she has the moves to do so. Mature is very combo-friendly and has a nice set of meter-less combos. She also has a nice projectile that covers a lot ground. One can easily say that this is a much better iteration of Mature than the one from KOFXII. Mature is a very fun character to play and she sets a good standard on the true concept of rush down. The player should be careful about using her Death Row rekkas because they are not very safe on block. Another downside is she lacks any particular command moves - however, her regular moves have very good priority and Mature can conduct a series of hitconfirms this way. The overall concept of Mature is make good use of her special moves and apply pressure onto the opponent. It is possible for Mature produce a load of chip damage and increase the possibility of breaking the opponents guard because her drawn out block strings. Basically, Mature is more dangerous than what the KOF series implies. If you want a rush down character with larger special move set and utility, Mature is the woman the player should go to. Many of her combos altogether are damaging, especially when using combos into regular/EX Metal Massacre or Death Row Rekkas. st. A: 25 damage, chain/cancel-able, hits mid. Mature does a light forward chop towards the opponents face. st. B: 30 damage, cancel-able, hits mid. A forward side kick. This move has pretty decent reach and cancels into special moves. st. C: 80 damage, hits mid. Mature will turn and do a chopping attack towards the opponents mid section while moving forward. This move should be used in moderation as it is a decent a pressuring tool. This move will can still cancel into special moves. st. D: 80 damage, hits high. A high spin kick. Can be used as a grounded anti-air tool. Whiffs on crouching opponents. cl. B: 10, 20 damage, cancel-able, hits low. Performs a double sidekick. Both kicks activate from a single button press, but the first kick can be canceled. This is a very great normal to utilize, especially if you are conducting hit confirms. Cancels easily into special moves. cl. C: 70 damage, cancel-able, hits mid. Chops the opponents in an uppercut motion. Function as a anti-air for nearby opponents and it cancels into special moves. Extremely fast start-up and is used either to start combos or to frame trap opponents. cl. D: 70 damage, cancel-able, hits mid. Knees the opponents mid section. Cancels into special moves. Stick to close C to start combos and frame traps. cr. A: 25 damage, chain/cancel-able, hits mid. Chops at the opponents legs. Chain cancels and cancels into special moves. cr. B: 30 damage, chain-able, hits low. A very good hit confirming tool. Mature can chain into other normal such as her st.B or cr.A. cr. C: 70 damage, cancel-able, hits mid. Mature uses her outer arm to smack the opponent. Can be used for anti-airs. cr. D: 80 damage, cancel-able, hits low. A generic sweep motion. Can be whiff cancelled. j. A: 45 (40) damage, hits overhead. Mature performs a downward angled swipe using her nails. Good for air-to-ground or even air-to-air to beat out slow jump attacks. It may whiff on crouching opponents if performed too early in her jump arc. j. B: 45 (40) damage, hits overhead. Mature performs a jumping side kick. This move is a good air to air tool and has a small cross-up hitbox. It whiffs on crouching opponents, however. j. C: 72 (70) damage, hits overhead. Mature swipes her hand forward downwards, chopping at the opponent as she descends from the air. This is her jump in tool but it can miss if performed too early against crouching opponents. j. D: 70 (68) damage, hits overhead. Mature will whip leg outwards. Has a very good horizontal hit box for catching opponents in the air but completely whiffs on crouching opponents. CD: 75 damage, cancel-able, hits mid. Mature will spin around and whip her leg in an upwards motion. Can be whiff canceled into special moves and be used as a makeshift anti-air. j. CD: 90 (80) damage, hits mid. Mature will perform a steep downward angled kick towards the grounded opponent. Good for air-to-ground situations. Soft knockdown. GCCD: 10 damage, hits mid. Mature will perform the same motion as she did for her actual CD attack. Again, this move does not have that much range, so use discretion while using this move. Deathblow (b/f+C/D) Mature will hold the opponent with one arm, taunts them and then slashes them away from her. When done successfully, Mature is free to move around and set up offensive and/or defensive maneuvers. 100 damage, can be recovery rolled. Despair = (dp+P) This one of the more powerful yet unorthodox special moves in this game. Mature will flip into the air towards the opponent to start this move. When Mature performs this flip motion, this will give the player incentive to either let her land back onto the ground or press a punch button to perform the follow up (Press P for Tsuika follow up after Despair). When DP+A is used, Mature will travel a short distance. This about the equivalent of performing a short forward hop. If Mature does DP+C, she will jump very high into the air, nearly at full screen distance. This move can be used to for the sake of continuing combos, mixing up, and even for anti-airing the opponent. EX = (dp+AC) Mature will perform a short hop forward as the Tsuika follow up comes out automatically in EX version. This can be used as a legitimate reversal and can be comboed after. This move is still unsafe, so utilize this move wisely. The EX version of this move also has invincibility. ∟ Tsuika = (P) This is the follow up from the Despair notation. The player should press the punch button after inputting DP+P. This can be done anytime while Mature is mid-air from utilize the Despair motion. Mature will perform a swiping claw attack as she lands back onto the ground. The move itself is not particularly safe, but it does allow Mature interesting utilities. She can use this move as a preemptive anti-air, an offensive maneuver, punishing badly timed projectiles, and continuing combos. This move can even cross the opponent up if the punch button used at a certain point while pressuring the opponent. If this move done late on Mature's DP+C landing, she will actually be at a +3 frame advantage. Metal Massacre = (qcb+K) Mature will run towards her opponent and perform a turning slash motion towards the opponent mid section. The B version will cause Mature to perform a extremely short dash into her slash motion. Mature will travel a short distance. The D version will cause Mature to dash a much longer distance and then perform the slash attack when she gets close to the opponent. This move can be used to juggle the opponent and pressure them. This move is -4 on block, but it can be moderately difficult to punish at certain spacing. The B version of this move does one hit. The D version is three hits. (EX) = qcb+BD The EX version of this move does four hits and does quite a bit more damage. Comes out faster and still causes Mature to travel towards her opponent. This move can be used to juggle the opponent and pressure the opponent. This is -2 on block and is considered to be moderately safe, but beware of characters that possess 1 frame command throws. Death Row = (qcb+P) x3 This is Mature's rekka move. With each input, Mature will perform a painful slashing motion to damage the opponent and she will do this up to three times. All variations of this move are unsafe, but it does have very good use. The A version will make Mature travel a small distance, while the C version will make her travel slightly further. The player can hit confirm into this move from cr.B, close st.B. If the player fails to get the hit confirm, the second and third part of this rekka series should be omitted. The first hit of this move is -5 is on block but has a fair amount of push-back but may be punished by certain moves that can reach it quickly. This move should be used to punish opponents after cancelling from a normal or to hit confirm into. Mature's rekka does three hits per input, therefore it is possible to get up to nine hits. What should also be noted is that the rekka does quite a bit of chip damage as well. (EX) = qcb + AC This version is a bit faster on start up and can cause Mature to perform her a slashing attacks up to five times. This move is still unsafe, but it does offer Mature the ability to chalk a lot more damage during her combos. Ebony Tears = (qcf~hcb+P) This Mature's projectile. The projectile in general has a lot of start up but can be put to very good use, especially for players that want to set up a good pressure game. Mature will reel backwards little and then swipe her hands downwards to create a rather large projectile that travels forward. The A version will give Mature +1 frame advantage as the projectile travels slow. The C version will make Mature -1 on block but the projectile travels a bit faster. The projectile is very large so it is very hard to jump over. Use this in moderation to zone the opponent and set up Mature's pressure game. (EX) = qcf~hcb+AC Mature will launch a projectile that will hit the opponent three times while travels around the same speed as the A version of the projectile. This move will give Mature the incentive to follow up with more damage and rush down. Nocturnal Lights = (qcfx2+P) Mature will perform four painful swipes while traveling forward. This is a decent method of ending combos and punishing opponents as it comes out rather quickly. This move is unsafe but it does allow Mature to net more damage out of the combos she is utilizing. This move can be Max Cancelled. (EX) = qcfx2+AC This version of the move will cause Mature to perform extra slashes and do a lot more damage. This version of the move can also be Max Cancelled. Heaven's Gate = (qcb~hcf+K) Mature will taunt the opponent a little before performing a quick dash forward. When Mature connects with the opponent during the dash, she will grab the opponent with one arm, take them towards the wall and violently slam them into it, much like Rugal did with his Gigantic Press. This can be very good move as it has invincibility (and projectile invincibility) start up. Unfortunately using this move as a anti-air isn't recommended because it can be safe-jumped easily on the opponents decent, and it might miss if you time it at the apex of their jump. While this move is unsafe, it can be Max Cancelled and can also be used to finish combo and net a lot more damage easily. Awakening Blood = (qcb hcf+AC) Mature will remove her eye patch and then disappear off of the screen. Mature will then summon a red stream of Orochi energy to slam downwards toward the opponent to destroy them. This is a pretty decent Neo Max as it can actually hit the opponent overhead. The move itself goes a full screen away, but it can be dodged if the character jumps upwards from the far side of screen. The move in general is very lethal and does a health amount of damage, especially when it is used to end combos. (1) St.C HD st.C qcb+ACx5 DC qcb+D qcb+B qcb+B DC DP+A~A(delay the hit)land qcb+C (1-2 hits)DC qcb+D delayed qcb+C(1-2 hits) DC qcb+D qcb+Cx3 DC DP+A~A(delay the hit) land qcb+Cx3 st.C reset 667 dmg + a little meter build at the end. 2.) cr. A > cl. C - 4 frame gap between cr. A and cl. C. 3.) cr. B > cl. C - 4 frame gap between cr. B and cl. C. 4.) qcb+D > far B - 4 frame gap between qcb+D and far. B. 5.) qcb+D > cr. B - 3 frame gap between qcb+D and cr. B. At this distance, Mature can resort to using her projectile (QCFHCB+P) to start an offense. Mature can use this opportunity to gradually draw herself in for the offense. Be on the look out for zoners if they try to start an offense of their own. If the opponent is quickly trying to close the gap between them and Mature, she can move and start an offense of her own, or she go for a whiff punish. The projectile is good for dealing with a lot of issues with the long range approach, especially the EX projectile. At certain instances, the Mature player can go for DP+C and the punch follow to frame trap the opponent if they are really trying to avoid Mature. If the opponent is trying super jump in on Mature, she can easily punish or discourage their pressure with with a preemptive j.CD, a well timed DP+P+Punch follow up in mid air, EXDP+P, or her QCBHCF+K. Last, Mature can quickly close the gap between herself and the opponent with QCB+D. Mature gets a pretty good frame advantage when she hits the opponent successfully with her QCB+D, allowing her to score a st.C within a combo! Even at this distance, Mature is still relatively versatile and threatening because the opponent has ample to time to plan their offense during the match. This where Mature should start attempting more pressure. At this range she can open her opponents defense up with carefully timed DP+A into the punch follow up to get the frame advantage when Mature gets close. Mature can also use her cr.C and DP+P and punch follow up for the sake of discouraging the opponents offense a bit. Mature can also poke a little with her st.B and her st.C while drawing herself if she has to stay on the ground. Last, Mature can resort to utilizing her QCB+B or D to quickly start another offense and to catch the opponent off guard. Mature can also use her QCB+B or D as a whiff punish. This will cause Mature to draw herself close to the opponent out from the mid range. Cornered Opponent Mature excels at this range. Mature has really awesome hit confirming. Some of Mature's moves are considered unsafe on block, but the first hit of her rekka and, to an extent, even her qcb+K can be used to spacing the opponent away while trying to continue with the characters pressure game. It is important to learn how to hit confirm into her rekkas and then convert into be combo damage because this is what Mature excels at as a character. When Mature is up close, Mature should retain pressure with her normal moves (cr.B, cr.A, close st.B, st.C, j.CD, and j.C), her QCB+B, and her DP+A into the punch follow up. The reason why Mature's DP+A and punch follow up are important in this match is because she can simply frame trap with this move from up front or cross the opponent because Mature and can use the initial DP+A jumping animation to jump over crouching opponent and blow them up for getting too overly defense. The cross up itself is relatively safe and Mature can still retain her pressure and mix up game from there. This why Mature is so dangerous because she can terrify the opponent with quick movement and mix ups options. While you can also whiff punish your opponent hop pressure attempts with EXDP+P or her Heaven's Gate DM (the latter being unsafe on block). Another to keep in mind that Mature has a lot of damaging combo options after blowing up the opponent. Cornered Continue to pressure the opponent with DP+A and punch follow up towards the ground. Keep the opponent in the corner as much as possible. Mature has pretty decent air to air moves that prevent the opponent from getting comfortable with hops and super jumps, plus she has multiple tools on the ground to keep the opponent at bay. Mature's can pressure the opponent and lock them down a bit with her st.B, QCB+K, and several other of her block strings and plus frame/frame trapping tools. Mature does pretty well without meter. In fact, she gets a very decent amount of damage from her BnB combo cr.B, st.B (both hits), qcb+Px3 rekkas. Mature also has nasty frame trap set ups off of her DP+P, punch follow up at the lowest height, leading to more damage. Another thing about Mature is... due to how her combos from up close work, she builds meter extremely quickly. Mature also has the tools to play multiple roles. She CAN zone the opponent out with her qcfhcb+P projectile because of how wide it is (the opponent will have a hard time super jumping, so it does limit the opponents movement options somewhat - using the projectile still requires a lot of discretion against skilled opponents). Mature's normal moves also fair pretty well in a lot of situations as well. Her st.C comes pretty quick. Both of standing heavy normal moves can be used as preemptive anti-airs. Mature can st.A to anti-air opponents and put a stop to hop pressure to a large extent so that she get back on the offense herself. Mature's j.CD is also very good, especially on counter hit because then it will lead to more damaging combo options without the expense of meter. Again, Mature builds meter very easily when she is hurting the opponents, thanks to her multi-hit rekkas and how lethal she can be from up close. With one meter, Mature can use her EX projectile, qcfhcb+AC. The has higher gauge (three hits)and it comes out relatively quick. You can use this to zone the opponent out from the full range. With this version of the projectile it will also bit a bit more easier to follow up and rush the opponent down then mix them up accordingly. The EX projectile works like a "shield" of sorts, allowing Mature to "push" herself onto the opponent while they are trying to defend themselves. If they try to roll through the projectile normally, Mature can meaty them or go for a throw to punish the roll attempt. Another thing that should be noted for Mature is that she gets decent wake up options and reversals which are her Heaven's Gate DM and her EXDP+P move. Heaven's Gate can even go through projectiles on its start up and can be used easily as a combo finisher, but the player needs to be careful; because it actually has a large amount of start up. EXDP+P has quite a bit of invincibility on start up and it Mature can combo after it but it is unsafe on block. This can help Mature do quite a bit of damage off of a reversal like this if the player is careful. With one bar, Mature can juggle the opponent with EXQCB+K as it does cause her to travel forward quite a bit. Then she can follow up with a series of QCB+K's and other moves during the same combo. Mature can go quite a bit of damage with just one bar, which is part of the reason why she is so versatile. Mature can conduct more elaborate combos with just 50% drive meter. It will behoove the player to optimize all of her options available, whether it be to punish or to conduct a mix up in a way where it will allow Mature to convert into another good combo. In the corner, Mature will also have more longevity in her juggle combos if she manages to launch the opponent successfully, though the player needs to be quick and precise with their inputs. After hit confirming with Mature's qcb+Px3 rekkas, Mature can drive cancel into her qcb+D. st.C (or cr.B, st.B) qcb+Px3 rekka [DC] qcb+D, qcb+B, qcb+B...... So on. If the Mature has another drive, she conduct another drive cancel, leading to really big damage. This is only an example of what Mature is capable in terms of drive cancel combos. \ Another element that sticks out the most in Mature's general game play is the overall longevity of her combos and the damage that comes with it. She can also proceed strike fear into the opponent with her mix ups and frame traps, especially when hitting the opponent successfully with drive cancel combos. With one bar and one drive, Mature can make of her EX moves within how combos and she will also be able to finish a lot of her combo off with her own DM's. Both of her supers are great for finishing combos, so it is best to save them after getting that damage necessary from which ever combo you conduct, whether it before from a hit confirm or st.C or j.D. After performing a combo such as st.C, qcb+Px3 [DC] qcb+D, then she can simple finish the combo with Heaven's Gate or she can go for another drive cancel into a possible EX move (EX DP+P/EXqcb+K for example after starting the juggle combo) after the rekkas, that is if she has two drive meters with one bar. She can also start her combos off with st.C, EX Rekkas and then go from there. Mature's EX moves are generally useful for extending her own combos during juggles. The player can use EX qcb+K to start combos and then drive cancel into her rekkas quickly. With a bar and a drive, Mature can get well over 500 damage, which is essentially half of the opponents life. It is important to keep in mind that she a lot of methods of converting into short/long term combos because a lot of her move either have great frame advantage on hit or set a nice lengthy juggle for Mature to defeat the opponent with. Mature may not have any command moves but, this does not stop Mature from being the beast that she is. She is a offensive rush-down character, much like Mr. Karate and Duo Lon... Mature one of the best cl.B moves in the game because it is a two hit combo and can cancel into other special moves. Mature can do pretty well without meter and she can build meter at a decent rate thanks to her Death Row rekka specials. Here, the player has easy access to BnB's combos like j.C, cl.B, > qcbx3 A or C. The EX version of her Death Row does five hits and the player can rake up a serious amount of damage this way. Mature's projectile has a rather large hitbox but the player should understand that people CAN STILL JUMP OVER THESE in spite of how tall the projectile looks. However, it is a genius projectile and the EX version will help shut the opponents options down even more. The player should look out for its start up time so it is best to use this move to apply a little more pressure after a knockdown or in moderation. The player can close the opponent down using qcfhcb. A or C then DP.A - after then you try to use a jump in to option select throw/throw tech or a cross-up or block and punish with another BnB combo. Last, Mature can cancel her Metal Massacre into her Super moves. Mature's Metal Massacre is safe on block and she can capitalize with a s.C or she can bait a unsafe reversal and punish from there. If the opponents wants to block, then they are still in trouble sense she's kind of like Iceman from MVC2 - lots and lots of chip damage. Here, you can either save meter while using safe pokes and punish combos then rushing the opponent down, trimming their options - or you can go wild with EX moves and all if your second character is someone like Athena or Kyo... Her HD combos are easily accessible and damaging too: j.D, cl.B, HD activation, cl.B, QCB.Ax2, HCB.B, QCB.Ax2, HCB.B, Or cl.B, HD activation, cl.B, QCBx3 > Heaven's Gate > Neo Max for a easy yet damaging HD combo for 3 stocks. The player can continue their assault during HD mode and then do Heaven's Gate > Neo Max to maximize their damage. 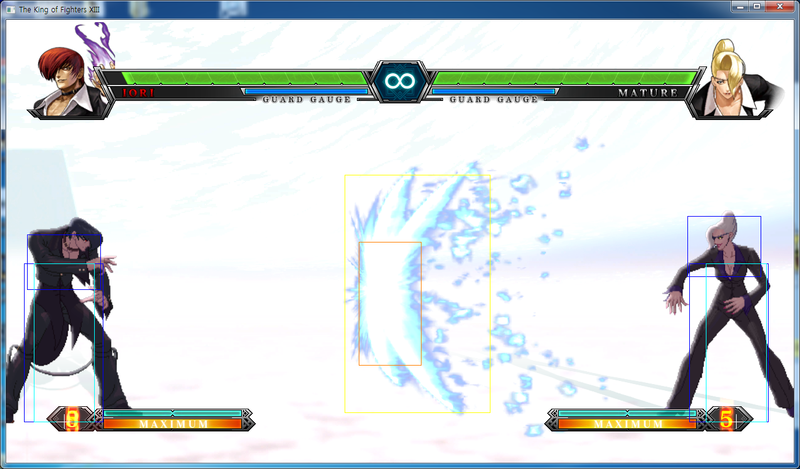 Heaven's Gate has projectile invincibility it can work as a good counter attack against zoners and can be comboed into. Mature plays the same role as she did in the first position, but only having four meters available. The problem is that she might be spending meter as well in this position. She may have good meter-less combos but as a meter builder, Mature can benefit more from characters like Kula or Yuri. Mature should probably be played a little more cautiously in this position, though she can easily make a good battery character because of her great offensive game. In fact, she is a good battery character, because her special moves have multiple purposes. Mature's special moves coupled with her ground normals and options selects makes her high/low mix-up game a bit more simplistic. Now imagine this with HD combos, four stocks, and a nice set of special moves. Mature's special moves is what helps her stick out as a very good character. Mature can be a very good anchor and has a lot of comeback potential. The thing is, Mature has many tools available. Projectile and her DP > A or C can be used as preemptive anti-airs and has nice priority. The EX version come out automatic and does a nice 140 damage and the player can do a reset and continue a good mix-up or option select block punish or throw. Mature can use her moves, trimming the opponents life away nicely and then set up for a crouching guard. Also, after a counter blow back attack, Mature can whiff cancel into her Neo Max as well. Mature st.C comes out very quickly as well, especially after her rekka combos or her Metal Massacre. A good HD combo would be something like this... j.C, st.C, (HD) st.C, [qcb+Px3 (7)]x3, qcfx2+P, qcb hcf+AC as a nice finisher. It does not take that much meter to do a serious amount of damage, which is why she should be put in this position or the first position while other character can back her up. Mature is very nice against zoners and defensive players because she can blow them up quickly and she has a nice set of block strings and chip damage. The player can make a win/win situation if they consistently make good reads. Both versions of Andy's Zaneiken (db,f+P) are unsafe. Punish with st.B, and qcfx2+P. Stay at mid range when fighting Andy so that you can punish any badly timed projectiles or jump ins. Counter act jump ins with st.D, cr.C, close st.C, j.A, and j.D. Mature's qcf,hcb+AC is a three hit projectile and can be good for out-pressuring Andy and stopping a lot of his own pressure. Stay within mid or close range against Ash, but try to retain caution as Ash does have viable wake game (D charge U+K). punish any badly timed projectile. When Ash suffers a knockdown, have DP+P (and the follow up) ready for a meaty. Otherwise, go for a hit confirm (cr.Bx2, st.B). Mature's qcbhcf+K has completely invincibility on start up. Use this if the Ash player keep tossing projectiles or pressing too many buttons. Athena's jump is a bit floaty, so take advantage of this and use a ground anti-air. You can also resort to j.A as it is a very quick. Beware of Athena's j.CD however. Don't challenge Athena in the air too much if she has meter available. Athena has a lot of options while she is in mid air. Don't get cornered by Athena - she can gain advantages on her qcb+A (Psycho Ball). Athena gets weak when she is cornered so get ready to conduct mix ups and look for hit confirms into Mature's combos. Always try to retain Mature's space at mid screen so that she will have enough room to back dash, jump, and roll when necessary. Getting cornered against Beni is never a good idea. Use Mature's EX qcfhcb+P to put a stop to Beni pressure and start your own. Get ready to conduct a mix up after she launches her projectile. If Beni has meter available and you're trying to pressure him, don't get too jumpy - he has several DM's that are relatively quick and/or have invincibility. Tread lightly against Billy - He has some of the best normal move pokes in the game. Draw yourself in closely for Mature's offense. Should Billy actually get close to Mature, Mature needs to block appropriately and punish Billy's hop pressures with close st.C. The Mature player needs to be a little more passive in the match up. Space yourself away from Billy's f+A and go for whiff punishment. Most players will resort to this as a combo ender and as a legitimate poke. DO NOT get cornered. Time your jumps carefully, because Billy does have plenty to offer in the anti-air department. A lot of Billy's move are moderately easy to whiff punish (some of which are actually unsafe anyhow). Billy does not have that good reversal options unless he possesses at least one meter. Once you get a knockdown, continue on with your pressure cautiously and go for those frame traps. Knock Chin out of the air with a preemptive j.CD and then try to follow up as much as possible. In this match up, Mature needs to be one pressuring, not the other way around. Maintain the offense, but be a little more cautious when Chin has meter available. Clark's b~charge~f+P is punishable, so get ready to destroy the opponent and continue offensive pressure when the opponent throws this out. options towards grounded opponent. Always be ready to hop or block. Stay within mid or close range against Duo Lon. EX DP+P and qcbhcf+K both have moderate invincibility start up, so if the Duo player is reckless pressing too many buttons or doing badly timed hops, you can punish him with those two moves. Hop jCD is a very good option against Duo Lon who are trying to rush down by hopping or jumping towards you too much. Stay within mid range and slowly push yourself towards Duo. Keep in mind that none of his rekkas are safe on block. Use cr.B to punish Duo's rekka (1st hit). The Duo player is more than likely to teleport after the 3rd rekka is blocked. Keep in mind that the teleport can be punished as he is not invincible, unless he uses the EX teleport. Duo has a set up where after he gets a knockdown, he can use CD attack but whiff cancel into his fire ball from the other side of the opponent creating mix up. Mature can either punish this mix up by using qcbhcf+K or rolling out of the way on wake up. Mature needs to pressure Elisabeth towards the corner. She does not have that many reversals without meter so take advantage of this as much as possible when Elisabeth does not have any meter. At the further ranges, get ready use Mature's projectile to trap Elisabeth. Don't overly aggressive if Elisabeth has one bar because she can avert a lot of pressure with her EX qcf/qcb+K dash and still get EX moves from, in which Elisabeth generally has useful EX moves. Try to retain a decent offensive pressure over Daimon. He is a rather big target so he'll have a hard time dealing with Mature's pressure and mix up game in the long run, if the Mature player is careful. Mature has a slight advantage over Daimon at further ranges due to her projectile options as it allows to get her offense prepared. Stay mid range against Hwa Jai. Be careful about using cr.B as his standing CD attack has low invincibility and exceptional range. It is possible to zone Hwa out with Mature's qcfhcb+P but his EX qcb+K has projectile invincibility so use that projectile from a further distance. Should Mature use her projectile she will have a variety of options for starting an offense back up. Mature's projectile should only be used as a method of start an offense. EX qcfhcb+P will do Mature some justice when she is trying to pressure Hwa. EX DP+P and Mature's qcbhcf+K DM both have invincibility. Punish/whiff punish with these moves if the Hwa player is pressing too many buttons or to combo into for good damage. Always have st.C ready for the likes of Hwa if he begins jumping/hopping/super jumping too much. This is one of Mature's quicker normal moves with good priority. Should Mature get the reset, she can start her mix ups and offenses from there. Beware of Hwa's Drink. Don't let get too close to you. Mature should be one pressuring Hwa, not the other way around. So time the GC Rolls and jCD's carefully to push Hwa back and prepare her own offense. 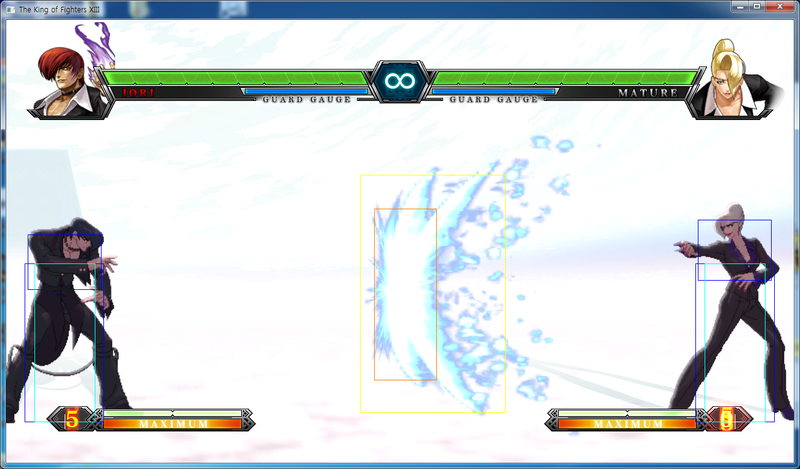 Mature's qcfhcb+P projectile will hinder Claw Iori's movement. Use this carefully against Iori to zone him out and capitalize accordingly. Retain your safety against Claw Iori because his damage output is very high when has meter available. Be on the look out for Claw Iori's j.D. You can use Heaven's Gate, (safely timed) Rolls, standing A, and crouching C to combat this. Stay on the move when you are the mid or close range. Beware of Iori's j.D. See Claw Iori's input. This version of Iori has a slight between Anti-air game due to possessing a DP. DP+C has full start up invincibility but can be safe jumped easily. Punish/interrupt first hit of rekka with st.A (cancels into special moves) or crouching B.
Punish/interrupt the second hit of rekka with st.A (cancels into special moves) or crouching B. Do not get cornered if Joe has meter. He has a stun combo that can kill if has a little meter. His DP+D is extremely easy to safe jump but don't rely on super jumps too much after getting a knockdown or if you're at the full screen range - EVEN if he tries to zone Mature out with projectiles. Mature's can punish projectile attempts easily with DP+C, punch follow up(lowest height for frame advantage if Joe blocks) or Heaven's Gate. Try to retain a mid range distance so that you can counter act projectiles consistently and get Mature's rush down game going. Don't go for too many super jumps. Go for safe jumps/hops to avert K's DP+C and punish accordingly. Also, K' has any-where juggle properties on his air qcb+K. DO NOT get hit by K's jCD. Retain a mid range distance between Mature and K'. If Kim has super meter, be on the look for EX qcb+K and his mid air options. Crouch underneath Kim's ff+A attempts and punish him accordingly. Stay the mid range and prepare to punish badly timed projectiles. Try to rush down King but be careful when she has one bar of super meter (look out for EX Trap Shot). Focus on cornering King a bit during the match. She will not be able to reversal Mature properly without meter. Kula's anti-air's in general are not all that reliable. Put a little more emphasis on carefully timed jump ins. if Mature is super jumping (or using DP+C) and/or running towards her afterwards. Mature still needs to focus on getting in close. What needs to be noted is that both characters have one thing in common specifically: Both of them have very lethal frame traps for high damaging combos. Avoid getting knocked down as much as possible; Kula's okizeme is very powerful. Pay attention to what the Kula player is going to do. Mature has an advantage from mid to full range because Kyo's neutral game isn't all that reliable. Discourage super jumps and rush down attempts with Mature's qcfhcb+P projectile. Mature can actually punish Kyo's upkicks (QCF+K) after the FIRST hit with her Heaven's Gate DM because it does not cause block stun. Otherwise, after blocking the second hit, just attempt a throw. Because, the Kyo player HAS to tech the throw anyway if they really want to be safe. Much like XIII Kyo's upkicks, NESTS Kyo's upkicks can be punished easily too under the same circumstances. Even with this version of Kyo, Mature still gains an advantage over Kyo at the mid to far range because of her projectiles and what Mature can follow up with that fact. Leona has very good air control, much like Mai does for example. Use discretion when attempting air to airs. Don't get too jumpy when Leona has meter because Leona can punish easily. Retain the mid range distance. Because, Leona has a projectile whose conceptualization is similar to Mature's projectile = Starting an offense. Knock Mai out of the air with jCD. Mai's mix ups become potent if she is in the air. The Mai player will only have two choices if she has a lot of meter: Mai will either save the meter for a reversal opportunities or she will use it to get high damage. Discourage this by playing a little more passively if she has meter. Mai gets very weak when she is cornered without meter. Focus on getting hit confirms and frame traps with Mature's DP+P (punch follow up). Mature has a good advantage over Mai on the ground, but Mai's normal moves are still dangerous. Don't hang in the air for too long, stay on the ground until you see a window of opportunity to capitalize with frame traps, cross ups, cross DP+P (Punch follow up), and hit confirms. Counter act projectile attempts by simply blocking or a carefully timed roll so that Mature is both safe and able to maneuver herself back to the advantage. GC Roll work very well against Mature's lengthy block strings. Keep in mind that rekkas are not safe on block. The opposing player needs to know how to visually confirm into them. If the opposing Mature player attempts to do a frame trap and/or mix up from up close using DP+C punch follow ups and normals, block carefully and then try to maneuver around with a roll/GC roll. Maxima is a very big target. Take advantage of this and try to retain a close to mid range distance while being on the offensive. Read the air EX qcb+P and out-maneuver Maxima for the whiff punish. Punish tackle attempts with Mature's light normals. Keep in mind that the player may be holding one of the kick buttons for Raiden's drop kick. Try to pay close attention to Raiden's habit because the type of kick pressed will influence the Raiden players play style to a degree along with the options he may have available. Mature can zone Raiden out to a large degree at the mid and further range with her projectile, timing it so that she can start her rush down on Raiden. In some cases, she can in employ the "hit-and-run" scenario so that she can avoid Raiden's combo into command grabs. Try to construct a rush down one Ralf. He will not get a reversal opportunity until he has at least on bar. Two bars he gets a legitimate reversal that is very damage. Take advantage on Mature's projectile in this situation to control Ralf players mobility a little or force them back onto the defensive. Robert is one of the better zoning characters of this game so because when conducting a rush down and don't rely too much on super jumps. Robert may have a lot of tools but a lot of them are sub-par to what the other characters excel at. Punish Robert's db~charge~f+D by running up towards him for the punish. You can punish Robert's db~charge~f+B with Neo Max in spite of its shorter recovery span. Advert DP reversal attempts with Mature's cross DP+A, punch follow up after a knock down. Control Ryo's mobility with Mature's projectile at the full range. Try to react to what Ryo does in the process of avoid the projectile. It is possible to whiff punish Ryo's qcf+P series sense they extend his hit box by quite a bit. Keep in mind that Ryo's qcf+C is -6 on block but is very difficult to punish due to push back. Try not to hang in the air for too long because Saiki has a lot of anti-airs and a DP+K counter act movement in mid air. Resort to carefully timed jumps. Saiki has to rely on his ability to zone around a lot with his projectiles (qcf+A) and his anti-air tools. Stay at the mid range and be prepared to punish bad projectile attempts. Counteract Saiki's rush down attempts Mature's normals and try to start the rush down for yourself. Control Shen's movement with Mature's qcbhcb+P at further ranges. Beware, some of Shen's moves (his qcfx2+P) will go through projectiles. Shen can also neglect projectiles to a large degree to build meter but Mature can still take advantage of this. Try to start an offense with some discretion because both Shen and Mature do have noteworthy normal moves in general. But, Shen is a tad slower than Shen. Take advantage of this and try to out maneuver him carefully. Advert hop and hyper hops with neutral/forward/back jumping hop normals, st.A, st.C or cr.C. Kensou can be relatively easy to anti-air because of his awkward jumps (his jump is floaty). Punish bad projectile attempts with Heaven's Gate and well timed jump ins. Rekkas after the first hit can be punished easily by Mature's st.B which can cancel into special moves. Takuma's projectile can be punished very badly by Mature at further ranges thanks to Takuma's recovery and start up periods. Mature can control the match to this degree for starting the offense at the mid range but she still needs to focus on mix ups and frame traps as with every other character. Don't get scared of Takuma's j.CD attack. Subvert Takuma's hop and rush down with back dashes, well read normals and movement options (rolling, GC roll, etc). Mr. Karate's qcf+C block string ender can be punished if Mature is busy CROUCHING from the move. (If the character is crouching the block string series will not cause as much push back). Defeating intermediate Mr. Karate's may require the Mature player to "wait" him out. Punish bad jump ins with Heaven's Gate or well timed normals. There is also invincibility on EX DP+P incase the Mr. Karate player gets over zealous on the rush down attempt. Against a good Terry, don't get too reliant on super jumps. Terry can anti-air very easily with the majority of his normal moves. When Vice has meter, be careful about jumps. Because, Vice can get a full combo off anything she does when she has at least one bar, due to EX Sleeve. Vice tends have trouble getting in without meter. Take advantage of this with Mature's long range options and then slowly migrate towards frame traps and mix ups after closing the gap. Yuri's dive kick does NOT hit overhead. This page was last edited on 15 December 2014, at 20:06.